Glut: a year in my patch: Happy Birthday Squatter! It's my birthday and to celebrate The Lad bought me a board game. 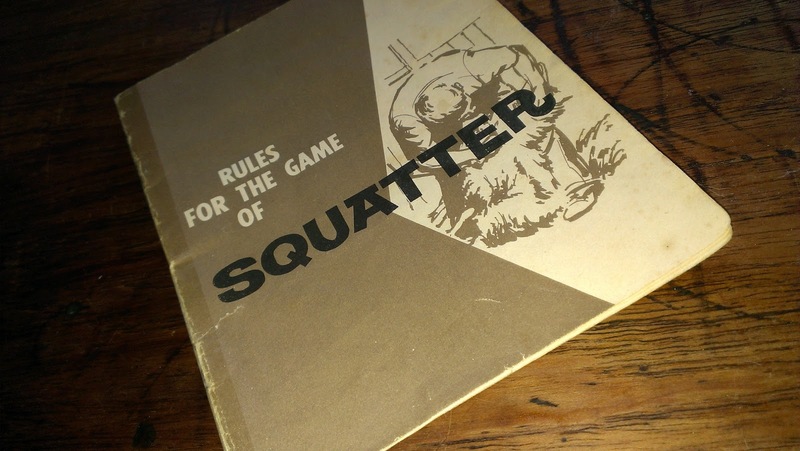 It's not just any board game, it's Squatter and it's not just any version of Squatter, it's the 1961 version and it's in beautiful condition. 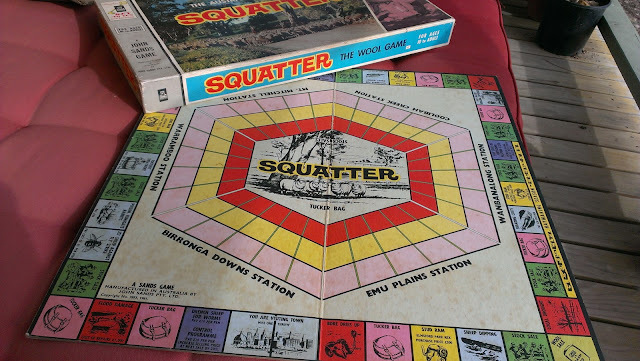 This game may be a mystery to many readers - it's a very Australian thing. You see Squatter is, according to the box, 'The Australian Wool Game'. 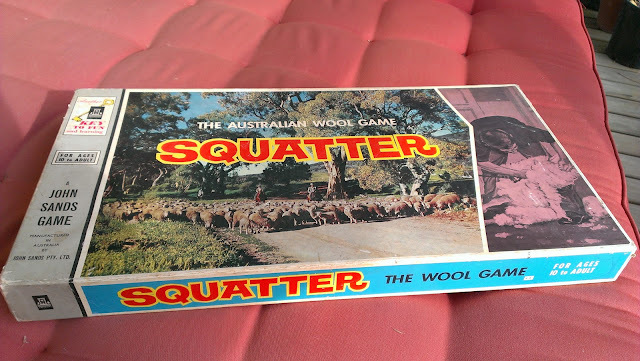 I had never played Squatter and our childhood house never had the game, but the Lad had played it as a kid, no doubt because he was raised in Canberra - the nation's capital and prime sheep grazing country, where the odd sheep dip ad used to appear on TV (do they still?). Now as we are contemplating getting our own sheep to raise prime lambs it was about time that I played Squatter and learnt the odd thing or two. You may ask, "how do sheep and squatters have anything to do with one another, squatting - occupying and reclaiming empty buildings as housing is pretty much a city thing right? No sheep in sight?" Well, yes, you are right, but in Australia squatting has an additional meaning. Here is the definition from Wikipedia.
" In Australian history, a squatter was one who occupied a large tract of Crown land in order to graze livestock. Initially often having no legal rights to the land, they gained its usage by being the first (and often the only) Europeans in the area... Eventually the term ‘squatter’ came to refer to a person of high social prestige who grazes livestock on a large scale (whether the station was held by leasehold or freehold title). 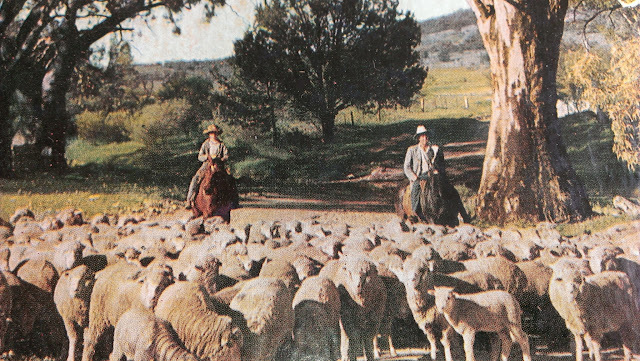 In Australia the term is still used to describe large landowners, especially in rural areas with a history of pastoral occupation. Hence the term, Squattocracy, a play on Aristocracy"
So now we know how sheep and squatters are connected, what of the game? 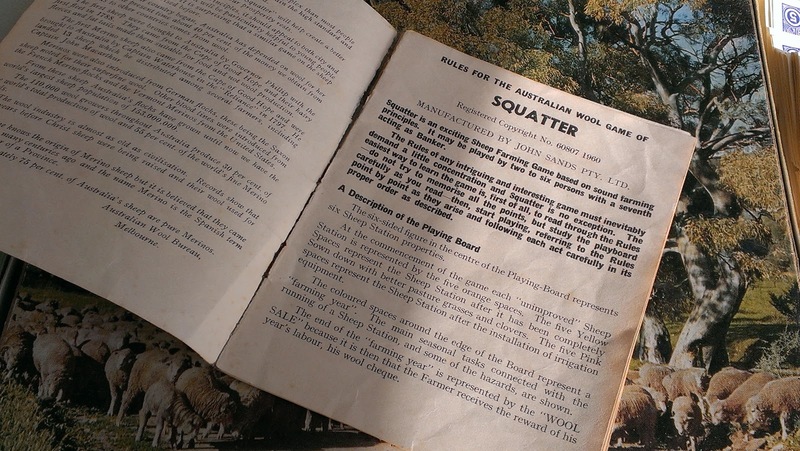 The Rules of the game state, "Squatter is an exciting Sheep Farming Game based on sound farming principles". Excellent, nothing like leisure as education! The aim of the game is to take your native pasture, 'improve' it and then irrigate it. At each 'improved' pasture stage of the game you can stock your property with additional sheep to increase your flock, clip and income. Each round of the board represents the farming year along with the round of farming issues such as worming, weeding, sheep diseases and their prevention and of course droughts and the occasional drop of rain. There is lots of chemical use for which you are rewarded at the next stock sale. You win if you have the maximum number of stock on your irrigated fields. 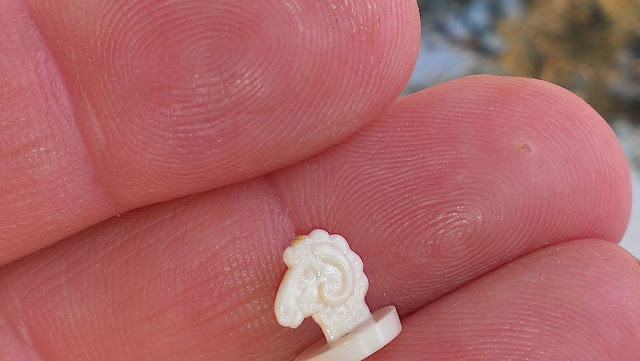 It is a fun game indeed, full of twists and turns and the buying and selling of these tiny little sheep. I want to play it again! What struck me about the game though is how much the game is 'of its time' and how things have changed. Firstly there is the whole gender issue - the farmer is definitely male and, being produced before the skin cancer public health campaigns, the farmer doesn't wear a hat! No one here is ever hat less! 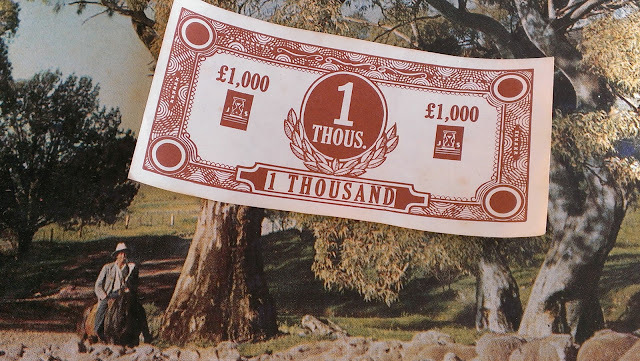 The money is in Pounds - our currency before we moved to a decimal system and Dollars. 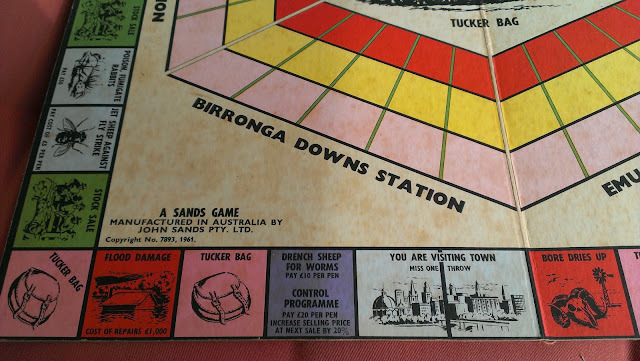 The issues have changed too with many of the features of the 1961 game reflecting an earlier era of 'best-practice' farming. 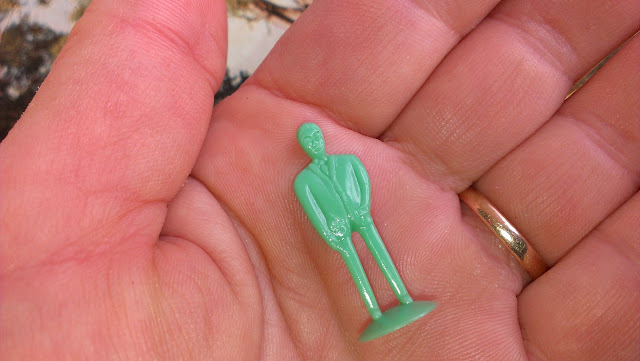 you could play with a female plastic farmer. Do you have a contemporary Squatter? Does it cover contemporary farming issues or has it stayed much the same? Do you have a favourite board game? I think our house must have been board game poor - not that that is a real problem. We only ( from memory) had Scrabble and Monopoly. I am enjoying my special Squatter. Is there a contemporary version? I'm going to make it my mission to find one. Like your lad had it as a kid. The thing I remember most about it is all those little sheep. I must look to see if I can find it at mum & dads. Not sure if there is a contemporary version but would be so interested to see if the farming practices and issues have changed. The little sheep are so cute. My friend had a plastic farm set for her kids - she used to relentlessly train the boys to say "here is the farmer - and her husband!" I like it! I think maybe I should also get one of those plastic farmyard sets. I LOVED them as a kid, all the little horses and pigs and cows and fences. Early imprinting for my current situation? I have never heard of this game (but it reminds me a bit of Monopoly) and now I want it!! I hope you have/had lots of fun playing it! I've bought an original version like this as a present for my Dad and I realised afterwards it came without the board! If it's too difficult I understand, I just can't seem to find it on the internet anywhere. Thanks for your help if you can and have a Merry Christmas!